John Stiles Collins was an American Quaker farmer from Moorestown Township, New Jersey who moved to South Florida and attempted to grow vegetables and coconuts on the swampy, bug-infested stretch of land between Miami and the ocean, a barrier island which became Miami Beach. Although the farming venture was not successful, with involvement from his family, notably his sons and sons-in law, John S. Collins also became a land developer. 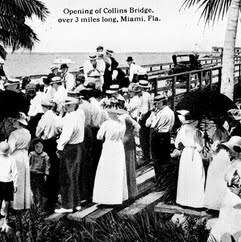 He and his family formed the Miami Beach Improvement Company in 1911, instituted the first recorded use of the term "Miami Beach", and built the Collins Bridge across Biscayne Bay from the established City of Miami in 1913. They built a casino, an oceanfront hotel and began residential development of the island. The Collins Bridge project ran short of funds and the 2.5 mile long wooden toll bridge was in danger of not being completed when 74 year old Collins struck a deal with automotive pioneer and millionaire Carl G. Fisher to loan him the needed funds in exchange for 200 acres of land. Fisher later described John Collins as "a bantam rooster, cocky and unafraid."